eat-sleep-knit: Jaywalker #1 is finished! Awesome Jaywalker! I really love the colorway. I miss the Regional Market! You make me want to go back to CNY so badly. I've been to the regional market quite a few times. You really never know what you're going to find there! Awesome Jaywalker! 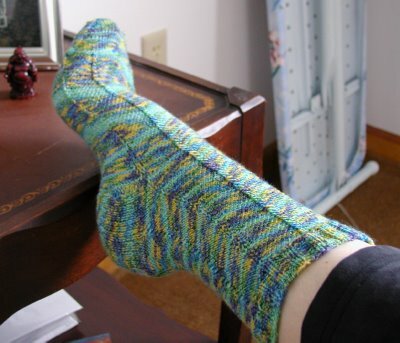 I tried it out with that same yarn but it was for my mom and when she tried it on it wouldn't even get over her ankle! Glad it worked out for you! I love the Regional Market. With warm and sunny days ahead of us, I'll be at the market quite frequently on Saturday mornings. Just love buying produce and flowers there. Since we're new here, we havent been to the regional market yet. But...does no one there sell yarn? The Ithaca Farmers Market (which is INCREDIBLE sort of awesome) has many yarn vendors! I'll be at the regional market before heading for our Saturday morning knitup (upstair's at Wegman's Fairmount at 10:30am) ... look for the lady with the polka dot knitting bag! I can't say I've seen a yarn vendor at the Regional Market. There might be some there on Sundays when it's the flea market instead of the farmer's market. I'll have to look next time.